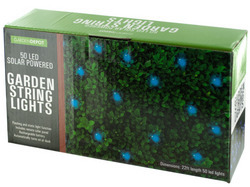 shop Blue Solar Powered LED String Lights Case 1 | bargainbrute. 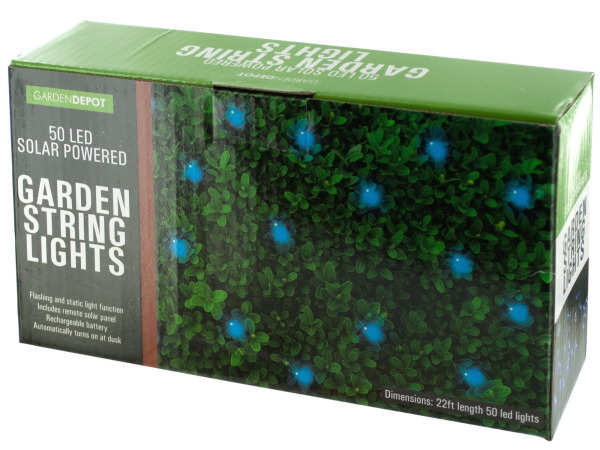 Make your garden glow with this Blue Solar Powered LED String Lights Set featuring 50 blue lights with flashing and static light functions and a remote solar panel with a rechargeable battery. Lights automatically turn on at dusk. No wiring required. Comes packaged in an individual box. Box measures approximately 8.75" x 2.25" x 4.625".